WJCU 88.7 FM, Auburn Records, The Exchange and Iron Ingo Stührenberg present the ninth annual Cleveland Metal Holiday Food Drive, set to take place December 2 at the Beachland Ballroom and Tavern in Cleveland, Ohio. Five decades of hard rock and heavy metal are represented on this year’s billing, with 70s legends GRANICUS being the oldest and 21-year old thrashers RADIATRIX the youngest. Doors open at 4:00 p.m. Show starts at 5:00 p.m. Two stages. Admission is free. 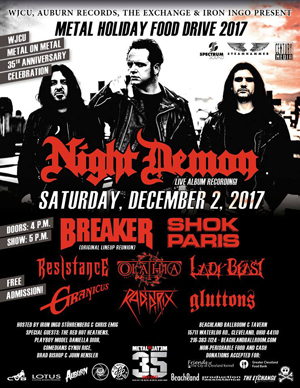 “NIGHT DEMON is proud to return to the city who put us on the U.S. map of metal,” said NIGHT DEMON frontman Jarvis Leatherby. “The fans have been begging for a live album, and we are finally here to deliver that. It’s a true honor to be recording our first ever concert album entitled Live Darkness in front of the Cleveland metal faithful. We have some great surprises in store. The setlist is amazing. It's definitely going to be a true Cleveland show!" Metal On Metal can be heard every Friday night from 6:30 p.m. to 9:30 p.m. EST at 88.7 FM in the Cleveland area or streamed worldwide at wjcu.org. A preshow party hosted by Iron Ingo will take place on December 1 from 7 to 11 p.m. at the Maple Grove Tavern in Maple Heights. IRON MAIDEN tribute EDWARD BE THY NAME featuring bassist Tim Frederick (WRETCH, DESTRUCTOR, VANDALLUS) will perform, plus all five original members of BREAKER will be on hand to meet with friends and fans. Admission is free. 21 and over.